A few days before the WWI Armistice, on 4 November 1918, a small town in the north of France, Le Quesnoy, was liberated from four years of German occupation by New Zealand forces. The town had been occupied by 1,500 Germans who refused to give themselves up. 400 soldiers from the New Zealand division were wounded, 93 of these soldiers died and were buried in Le Quesnoy’s local cemetery. So goes the history of this fortified border city. Founded about 1150 by Count Baldwin IV of Hainaut, the town went on to serve as a royal residence for 4 centuries. Charles V had the original fortifications modified in the 16th century and they were dismantled entirely under Louis XIV who commissined Vauban to overhaul the city during the years 1668 to 1673. The Belfry and the Town Hall were built in 1583. In the center of the Belfry there was a room reserved for guards and the bells were rung for sunrise, the opening and closing of work, and for curfew. On the top floor of the Belfry was a watchman's lodge from where the approach of an enemy, or fire could be detected in a timely manner. 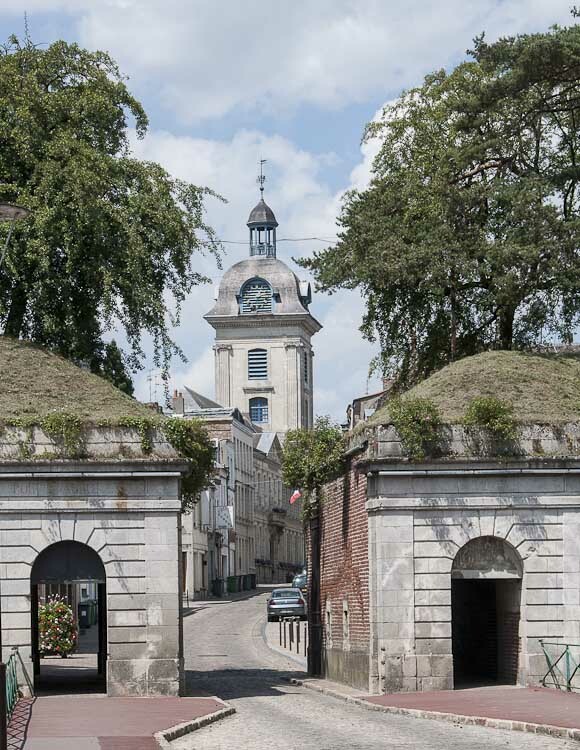 During WWII the town suffered several attacks and on May 19, 1940 the belfry was hit by an incendiary bomb. The top section containing the clock and the bells collapsed into the flames and the fire spread to the town hall. The belfry was restored after the war and today the carillon, with 48 bells, plays different tunes throughout the day. Pictures here. Châtellerault is larger town and is on the river Vienne in the Vienne department of the Poitou-Charentes region. The current population is about 33,000, down from the 1975 peak of 37,000 and it is one of the oldest populations in France with more than 28% over the age of 60. Châtellerault was established by the Count of Poitiers in the early 10th century became an important stronghold. The title, Vicomte de Châtellerault, passed in turn to each of three great French noble families: La Rochefoucauld, Lusignan and, from the thirteenth century until the French Revolution, to the family of Harcourt. Beginning in medieval times, Châtellerault became known for cutlery and sword manufacture, and in 1816 developed as a center for arms manufacture for the French government.The Manufacture d'armes de Châtellerault provided most of the infantry small arms used by the French Army and Navy. MAC, created in 1819, operated continuously until its closure in 1968. More picture around town are right here. Villars-les-Bois, population 250, is in the Charente-Maritime department of the Poitou-Charentes region. The altitude of the Mayor official residence is about 240 feet above sea level. 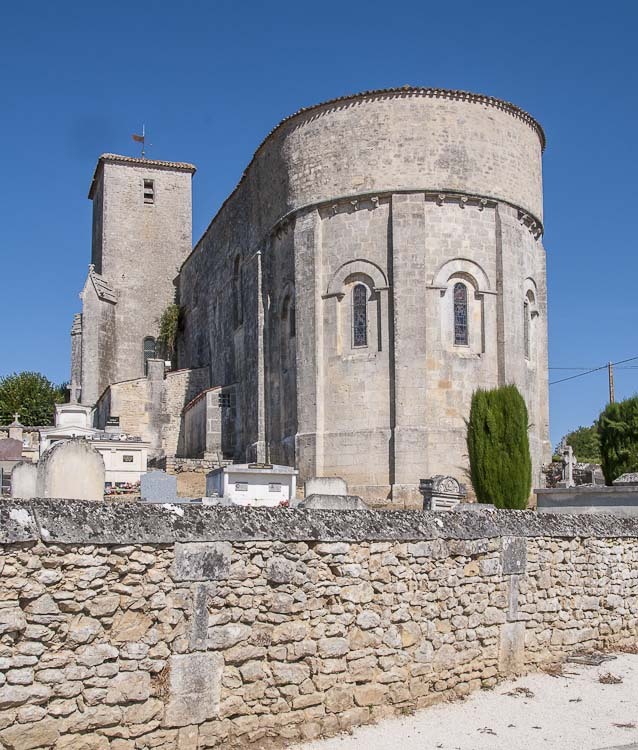 The "feature" in town is the 12th century Romanesque church of Saint Victorinien. The church withstood many attacks over the centuries a castle existed to the north which communicated with its bell tower by a walkway. The church was rebuilt in the 15th century; the castle has disappeared without trace. 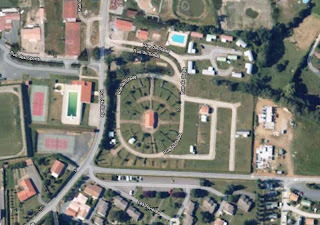 Located away from major roads, Saint-Césaire is at the crossing of two small county roads, the D131 and the the D134. Apart from that distinction, there is little to see or do in this village of around 900 people. The Romanesque church - another with the tower in the middle of the building length - is named for Saint Césaire and was classified as a historical monument back in 1913. At the time of the Revolution Saint-Césaire was referred to as "Cézaire, friend of the laws." 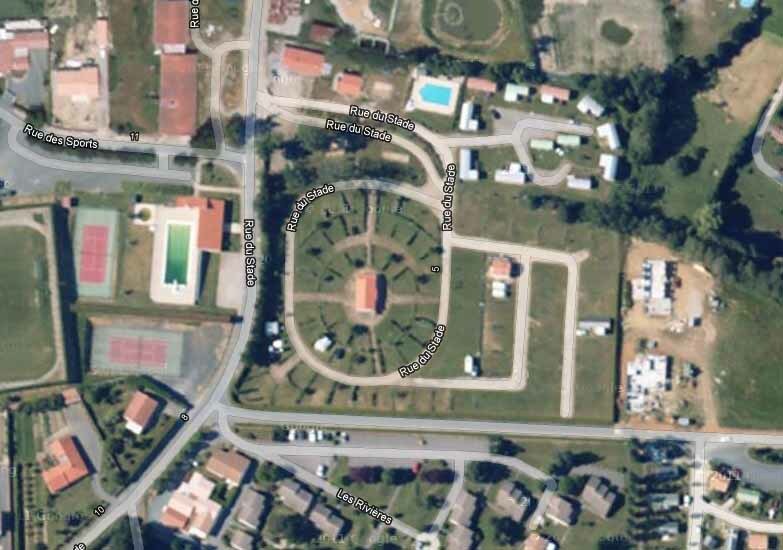 We visited simply because there is a small municipal Aire de Service near the crossroads and we spent a quiet night there although there were zero services, just a sloping parking lot. The village is perhaps best known however, as a paleoanthropological site. In 1979 French archaeologist François Lévêque discovered a nearly complete Neanderthal skull along with a partial skeleton dated to 36,000 years ago. It is was a significant event because it was found in association with tools and other artifacts formerly associated only with early modern humans (Homo sapiens) and not Neanderthals. Pictures of the church are here. 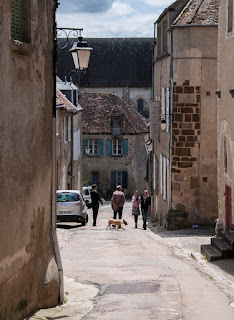 Saint-Sauvant is a hilltop village of about 500 souls in the Charente-Maritime department of the Poitou-Charentes region, about halfway between Saintes and Cognac, on the right bank of the Charente. The name is probably a corruption of the name of Saint Sylvain, bishop of Gaza in the 3rd century. Overlooking the village and the valley of the Koran is the Romanesque church of Saint-Sylvain dating from the twelfth century. Based on an outline of a Latin cross, the church has a nave of three single spans and a facade with a touch of military flavor. The interior is very sober and, contrary to tradition, the tower is built on the first bay of the choir. There is a medieval rectangular tower that provided a defensive outpost overlooking the valley of the Koran and the Pidou, probably from the 14th century. 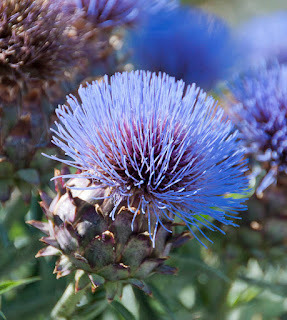 It is thought to have belonged to a castle which was dismantled during the Hundred Years War. The main historic houses are spread along a main axis formed by the streets of Market and Paradise, which lead to the church square at the top of the promontory. The village has a number of medieval houses of the fourteenth century and fifteenth centuries. See here for more views. La Chapelle des Pots was a potter's village for nearly eight centuries, with the first potters setting up there in 1250. Although the products were limited to modest kitchenware and cooking pottery this was the de facto standard in France and local potters produced decorative objects for the aristocracy and enjoyed robust exports to both Germany, England and elsewhere. In the course of the 17th century however, Italian ceramics began to appear in France with exquisitely detailed decoration. Some regional manufacturers adopted this new technology, including a factory in La Rochelle in 1721 and gradually the traditional pottery was relegated to utility and cook ware again, as the wealthier buyers switched to the more refined ceramic products. La Chapelle developed new mass markets for their goods, mainly in the colonies of Canada and Louisiana. In 1763 of course, France lost Canada to England and in 1803 Napoleon sold Louisiana to the United States. These were seminal events for the potters of La Chappelle - their markets vanished and the last pottery in the village stopped all production and closed its doors in 1906. Population peaked in La Chapelle in 1793 - yes, that's 1793 not 1973 - at 898 and today, some 220 years later, it is 890. From all that we could see, in a hundred years since the cessation of pottery manufacture nothing has been found to replace the lost revenue. 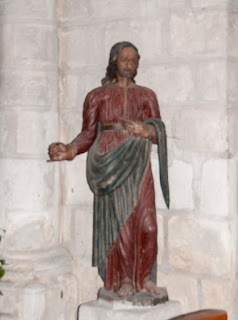 To our delight, Saintes turned out to have much to gawk at including major artifacts going back 2000 years or more. 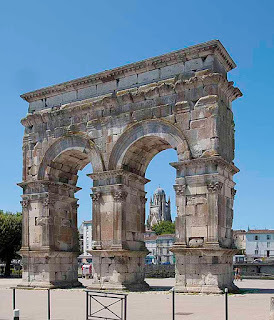 Originally a small Celtic settlement of the Santon tribe it was taken over by the Romans in the 1st century BCE at which time they established their regional capital on the site of modern day Saintes. The location was propitious as the crossing point of the major Roman road from Lyons and the river Charentes. In Roman times, the city was known as Mediolanum Santonum. A little west of downtown Saintes is the neighborhood of Saint Eutrope, that has developed over the centuries around a rocky elevation dominated by the basilica of Saint-Eutrope. This area also includes the remains of a Roman amphiteatre large enough to have seated the entire population of the town. There is not a lot of industry in Saintes, a few manufacturers of electronics, railroad equipment and hoists, but the city performs considerable administrative functions for surrounding area - government jobs for the unemployed! Overall though, a very enjoyable visit to this unsung city. The city of Cognac sits on the left bank of the river Charentes in the Charentes department of the Poitou-Charentes region in west central France. The town is on one of the pilgrimage routes to Santiago de Compostella and was first written about in the 9th century CE. By the time of the Hundred Years War Cognac had been substantially fortified but even so changed sides several times as the result of fighting and treaties in the region, thus confirming an enduring French trait. Francis I granted the town the right to trade salt along the river and this was a license for growth and prosperity which eventually assisted the town's development as a center for wine and brandy. The population of Cognac peaked in 1982 at 22,000 or so before settling back to a fairly steady 19 to 20,000 currently. The world's best-known brandies start life in the peaceful countryside surrounding the Charente River, just a hundred miles north of Bordeaux. In a twenty-mile area called the 'golden circle" encompassing Cognac and Jarnac, all of the world's notable brandies are produced. The largest church in Cognac is Saint-Leger. It was formerly the property of a former Benedictine priory and is now the main parish church of the city. Started in 1130, it was enlarged and renovated many times over the next three centuries resulting in a profusion of architectural styles. In 1598 and for twenty years thereafter, the church was converted to Protestantism as part of the religious wars upheaval. Sainte-Foy-la-Grande is pretty much at the intersection of three departments in the Aquitaine region of southwestern France. It is actually in the Gironde department but is close to the borders of both the Dordogne and the Lot et Garonne departments. With little in the way of industry in the area, no commerce on the river and declining agricultural employment as France slowly (and reluctantly it seems) catches up with modern farming methods, career opportunities in Sainte Foy are scarce. Population peaked in 1975 at around 3,350 but has fallen steadily for the last 30 years and by 2008 was down to 2,550 - a loss of almost one in four people. 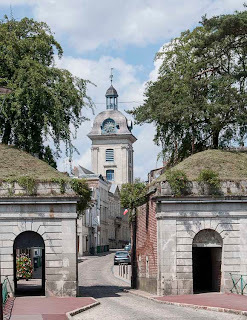 So, this quiet backwater, founded in 1255 by Alphonse de Poitiers, has been reduced to a large degree to dependency on tourism to the town and the surrounding countryside. 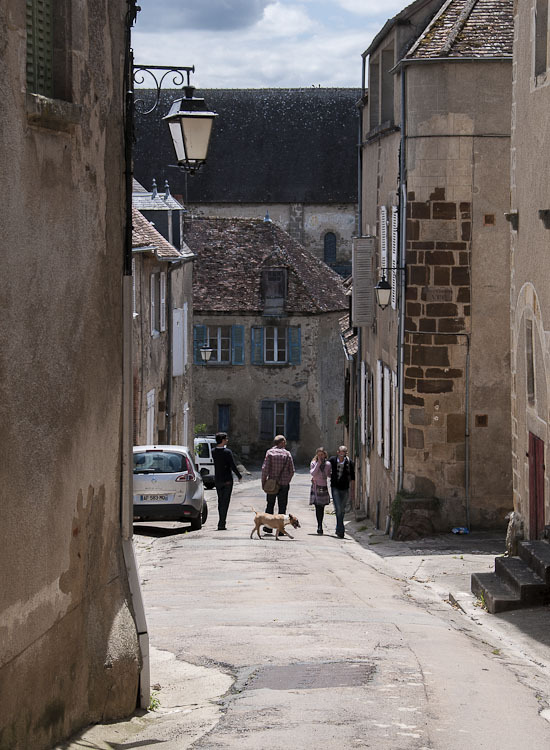 A major problem is that far too many impoverished towns in rural France have been backed into the same condition by economic circumstances and sadly only a small fraction of these have the wherewithal to develop a formula that works. Bergerac, with a population of around 28,000, is in Dordogne department of the Aquitaine region of southwest France. 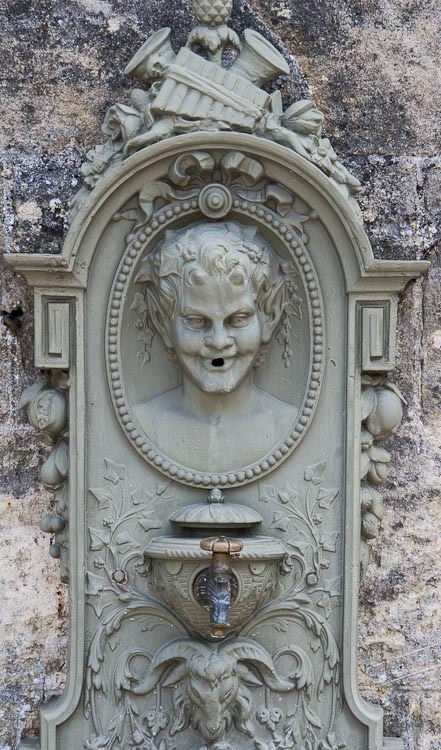 The area offers some of the finest wines in the Bordeaux region and the town relies heavily on its tourist industry, one feature of which is a tobacco museum in which, unlike in all the other museums in town, no smoking is allowed. Two statues of Cyrano de Bergerac, subject of a famous play of the same name by Edmond Rostand, can be found around town though the actual Cyrano never actually lived in Bergerac. Hercule-Savinien de Cyrano de Bergerac, March 1619 to July 1655, was a French dramatist and duelist. He is best remembered however, through works of fiction loosely based on his life. The most notable of these is the 1897 play by Edmond Rostand. In all of these fictional works Cyrano is featured with a huge proboscis, for a glance of which, people would travel from miles around. Although portraits suggest that he did in fact have a supersized schnoz, it was not nearly as large as described in Rostand's and other's works. 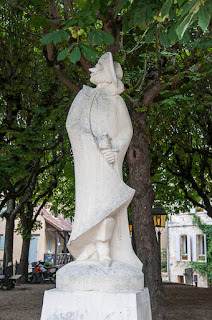 The model for the Roxane character of the Rostand play was Bergerac's cousin, who lived with his sister, Catherine de Cyrano, at the Convent of the Daughter of the Cross. Cyrano de Bergerac's works The Other World: The States and Empires of the Moon and The States and Empires of the Sun are classics of early modern science fiction. His mixture of science and romance in these works likely influenced many subsequent writers such as Jonathan Swift, Edgar Alan Poe. Pictures of this dour town here. Villefranche du Perigord is, or was anyway, a walled bastide town that was founded by Alphonse de Poitiers and chartered in 1261. Parts of the wall still exist although it is not particularly evident that the entire town was once enclosed. 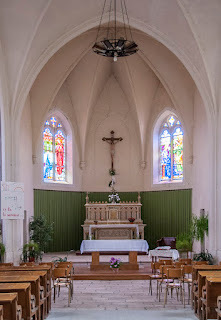 Further, the original fortified church no longer exists having been replaced in the 18th century by the relatively lightweight Our Lady of the Assumption. Originally the town was called Villefranche-de-Belvès and only adopted the du Perigord suffix in 1893. In 1960, the community of Saint-Etienne-des-Landes was merged into Villefranche du Perigord. The town is largely comprised of four parallel streets, almost entirely residential, with a single large square near one end. Looking around the main square, there is the 17th century arcaded Hotel du Commerce with a restaurant and other minor retail outlets, the church and then, on the other side, an attractive open market hall on stone columns. Finally, there is the ubiquitous Presse-Tabac come pseudo convenience store. The town is famed locally for its mushroom market and the House of Chestnuts to which a small museum is dedicated. 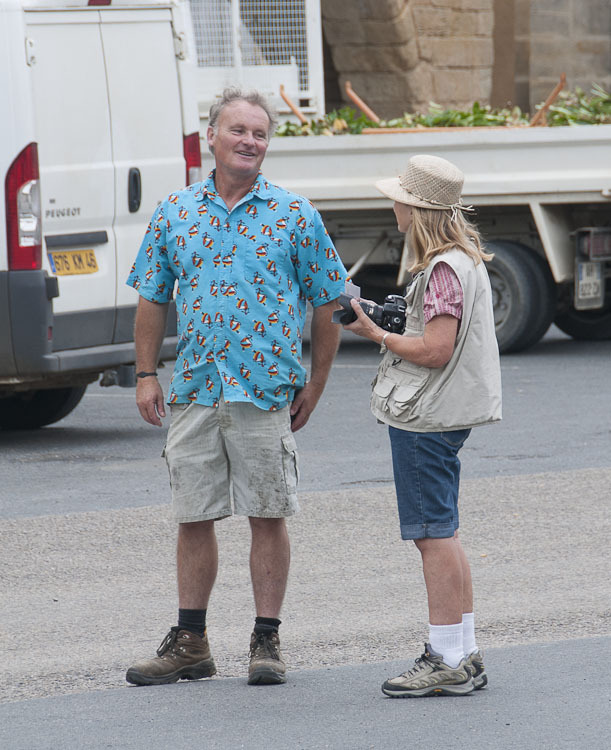 A pleasant couple of hours - pictures here. 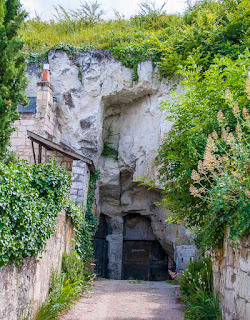 La Roque-Gageac is another defensively positioned village built onto the face of a limestone cliff on the bank of the Dordogne river. Today's population is a little over 400 people, way down from the 1,500 or so that thrived here on the river trade in the middle ages. Threatened by Viking invasions among other hostiles, the defence of La Roque-Gageac relied on a then new development, that of being built into the side of a cliff to greatly reduce accessibility for would be invaders. The construction of the castle began in the 12th century and work continued on and off through to 17th century until, finally, it was abandoned in the 18th century. In January 2010, a serious rockfall occurred and destroyed several sections of the fortress. This calamity followed earlier falls in 1920, 1957 (resulting in 3 deaths) and again in 1994. The site has been closed to the public and it is uncertain whether it will re-open. Halfway up the cliff, next to the little church, is a garden of Mediterranean vegetation thriving in a micro-climate produced by the southern orientation and the absence of wind. See here for more views. Saint-Amand-de-Coly is the name of both the community and the church in this village of 380 people. 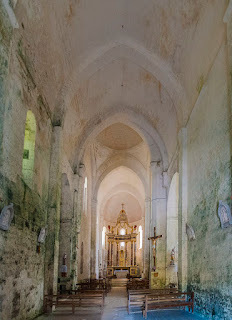 The church is a 12th century fortified Romanesque design. Its defences include walls that are 4m thick, a ditch running around the perimeter, numerous positions for archers and assorted blind stairways to mislead attackers. The church was constructed on the site of an earlier abbey chapel and was largely reconstructed during the 19th-20th centuries to produce an unusual combination of gothic and roman styles. The village is traditional Dordogne - houses with tiled roofs and yellow stone walls with a few still topped with traditional stone roofs. The village however, is dominated by its church. The church was built next to the abbey which has long since been in ruins and the church itself was extensively damaged during the 100 years war. It was the French Revolution however that finally ended Saint Amand's role as a religious centre. More pictures of this unusual village here. Beynac-et-Cazenac, the result of merging Beynac with Cazenac in 1827, is a village of about 500 people built on the cliff face below the Château de Beynac which completely dominates the landscape. 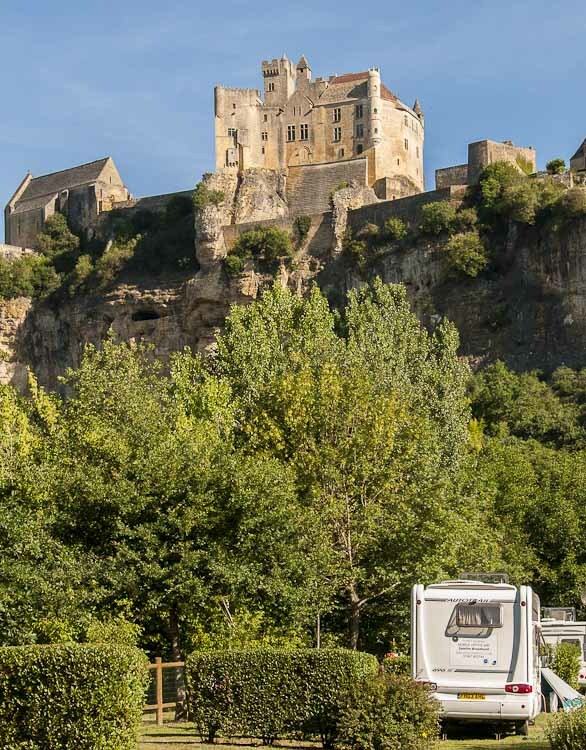 Situated in the Dordogne département the castle is one of the best-preserved and best known in France. 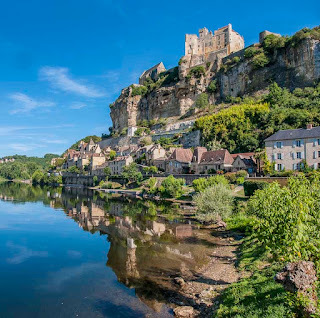 The river Dordogne flows by the foot of the limestone cliff and the castle was built in the 12th century by the barons of Beynac to control access to the valley. since the cliff face would discourage an assault from that side of the castle, the defences were built up behind the chateau with double crenellated walls and double moats. 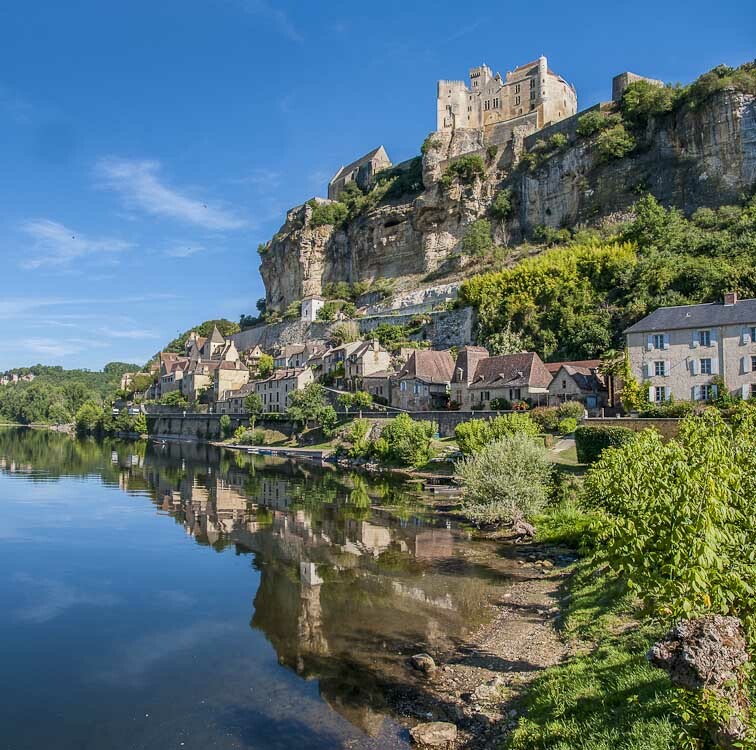 At the time of the Hundred Years' War, the fortress at Beynac was in possession of the French and the river defined the border between France and England. On the opposite bank of the river, the Château de Castelnaud was held by the English. Both changed hands several times over the centuries but usually through guile and treachery rather than direct military assault due to their extremely effective defences. In 1962 Lucien Grosso, 1956 French Olympic Bobsleigh competitor, bought the castle and restored it and it has served as a location for several movies since that time including Les Visiteurs in 1993, La Fille de d'Artagnan in 1994, Ever After in 1998 and Jeanne d'Arc in 1999. The village itself was used as a location for the film Chocolat in 2000. Pictures of this extraordinary attraction here. We had visited Sarlat-la-Canéda a few years back and had been awestruck by the sheer size of its pseudo 14th century town center. Our route this year took us through town and we could not resist a reprise; we were not disappointed. 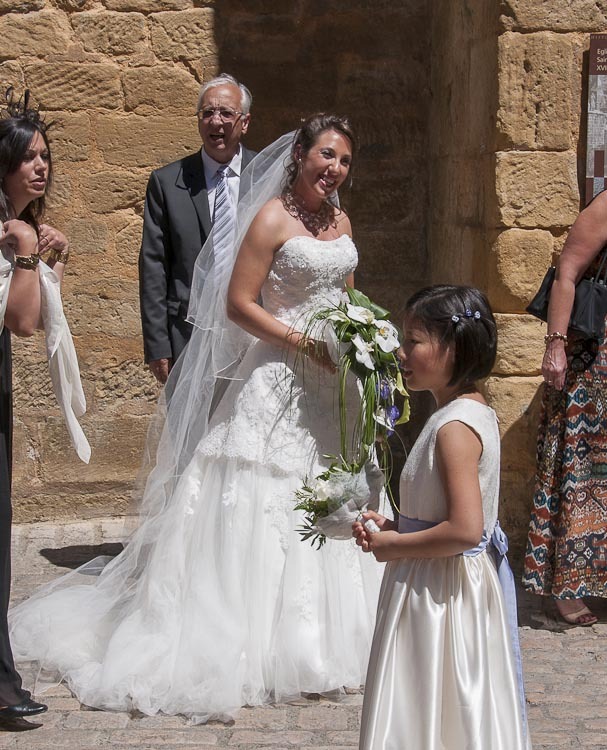 With a slowly declining population of around 9,000 souls Sarlat is a major draw on market days and puts on a great show. As luck would have it, it was market day! Sarlat developed around a large Benedictine abbey of Carolingian origin and the Cathedral is dedicated to Saint Sacerdos. Modern history seems to have overlooked this area, being as it is on the eastern boundary of the Dordogne department. The town benefitted hugely in the sixties from the energy and enthusiasm of writer, resistance fighter and politician André Malraux. As Minister of Culture from 1960 to 1969 he was responsible for the restoration of Sarlat along with many other sites of historic significance throughout France. The old town is about a third of a mile in length and consists entirely of impeccably restored stone buildings and is almost entirely pedestrianized. Farming is the economic mainstay of the area with products including tobacco, corn, hay, walnuts, cheeses, foie gras, wine and truffles. Pictures here. 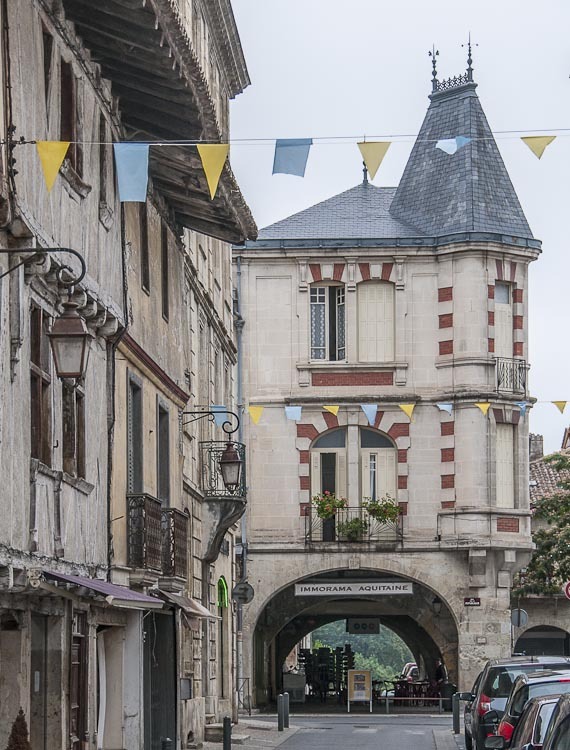 Thiviers is a small town in the Dordogne department of the Aquitaine region that prides itself on its foie gras (fatty liver), walnuts and truffles. Beyond these attributes it seems to major in hard luck stories. 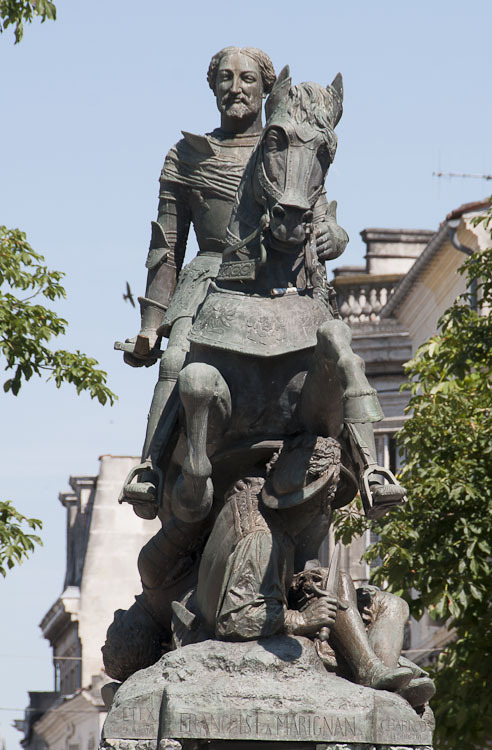 In 1211, Jean Sans Terre took possession of the town only to have it taken back the following year by Guy, Viscount of Limoges. From 1374 to 1376, it was again occupied, this time by the English who were then driven out by Charles VI. In the meantime, as though not content with these inconveniences, the town fell prey to plague and famine. In 1365 there were 433 dwellings in town housing around 2,600 inhabitants; by 1503 the number of occupied homes had fallen to just 20 as a result of these ravages. In 1575 along came the Calvinists, summarily slaughtering those who resisted the destruction of the city walls, the chateau and the church. A pretty sorry history that even today remains grim. The town is patently run down and, after its population peaked in 1975 at a little over 4,100 it has since fallen by 25% to not much more than it was in the 14th century. 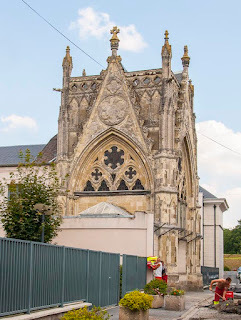 Dedicated to 'Notre-Dame', the big church in town dates from the 12th Century but has subsequently been altered many times, especially following the wars of religion during which it was partially destroyed. On two of the church columns are carvings of monstrous men. A little way to the south-east of the church is the renaissance style facade of the 16th century Chateau de Vaucocour, built on the site of a 12th century castle that was destroyed in the Wars of Religion. 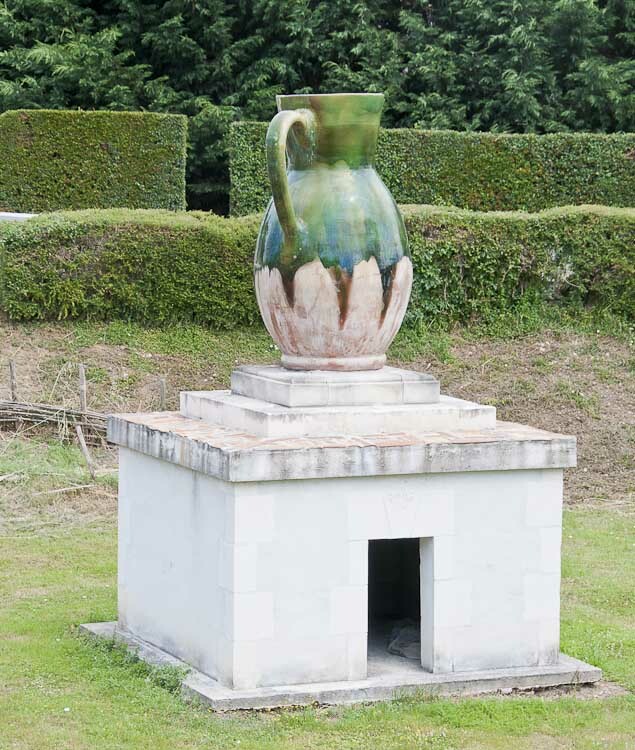 Thiviers has a sigificant history of pottery production and there is a museum in town dedicated to this industry. 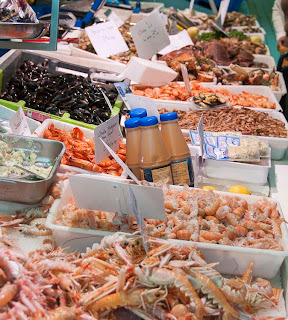 There is a market every Saturday morning. Check here for more pictures. Today, Saint Jean de Côle is a tiny town of 340 inhabitants. Its history began in the 11th century when the Bishop of Perigueux began the construction of the “Château de la Marthonie” and the Priory. In addition to this castle, the town also boasts a large church, an unusually shaped stone bridge over the river Côle and lots of half-timbered houses. The present Chateau de la Marthonie actually dates from a 15th century reconstruction following the 100 years war and has a wing that was added in the 17th century. One of the most famous residents of this castle was Mondot de la Marthonie, first president of Bordeaux's parliament court, adviser of the Queen Mother in Paris. Sacked by the protestants in 1569, la Marthonie fell into the hands of the Beaumont-Beynac family who are the current owners of record. Across the square is the 11th century church of Saint-Jean-Baptiste, an interesting example of Roman-Byzantine architecture realized in gray and ocher sandstone in an unusual plan organized in a semicircle around the apse. In summer time, concerts are held each week in the church. Originally the church sported a 42 foot diameter masonry dome that collapsed under its own weight and was replaced by a lighter wooden structure. At the north end of the village, the river Côle is spanned by a medieval hump-backed bridge with bull-nosed cutwaters projecting into the river. Every year during the weekend closest to the 8th of May, St Jean de Côle hosts a flower fair attended by more than a hundred exhibitors. More pictures of this delightful place here. The Aquitaine region comprises the most southwesterly part of France and among its departments is the Dordogne crossed by the river Dronne. 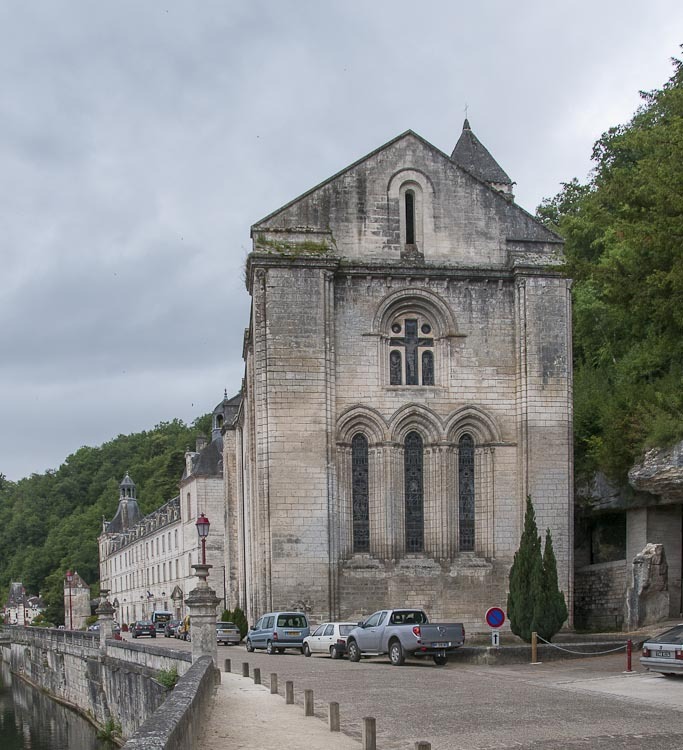 Brantome, a village of 2,100, began its development on an island in the river that lay in front of a Benedictine Abbey founded by Charlemagne in 769 CE. The abbey was trashed twice by Viking rovers, in 848 and again in 857, and was rebuilt towards the end of the tenth century. Further reconstruction occurred in the 15th century following the 100 years war and after the French Revolution the abbey was secularized. Today it houses the administrative office for the village among other activities. 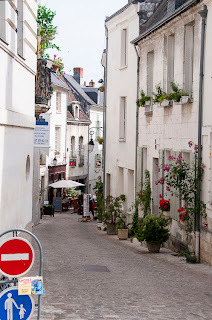 Like many other villages in the area, Brantome is an enchanting place to stroll through. Pictures here. Jarnac is in the Charente department of the Poitou-Charentes region in southwestern France on the right bank of the Charentes river. The city population peaked in 1975 at 5,000 and has declined about 10 percent since that time. François Mitterrand, a former president of France, was born in the city in 1916 and there is a museum in town marking this fact. 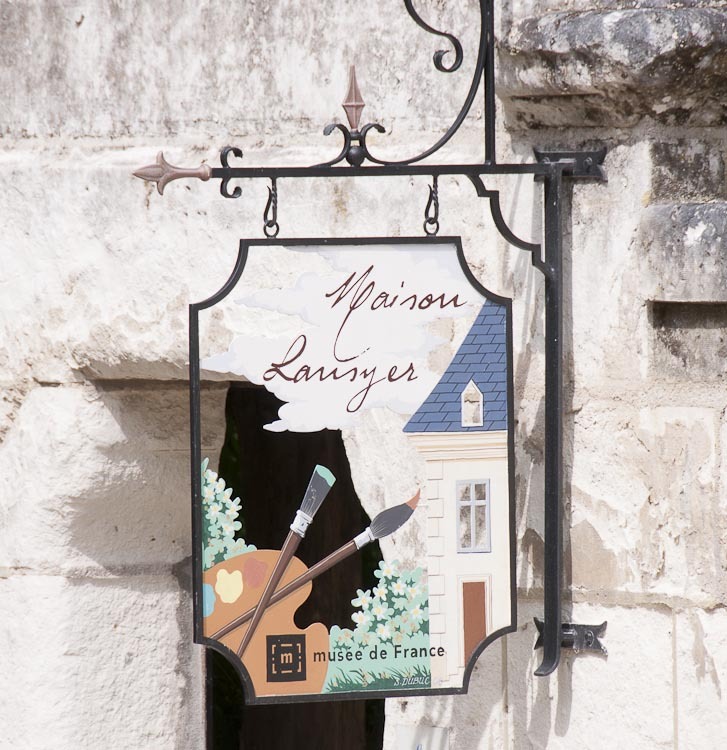 The region is renowned for the production of the Cognac variety of brandy and Jarnac is home to the Courvoisier cognac factory. In 1964 Courvoisier was acquired by Hiram Walker which itself was acquired in 1986 by Allied Lyons. Later Courvoisier was divested to the holding company Fortune Brands, which spun off several spirit manufacturers in 2011 to form Beam Inc. Staggering! Arçais is in the Deux-Sèvres department in the Poitou-Charentes region and is the only village actually in the Marais Mouillé, the "wet marsh", which forms the eastern half of the Poitou Marshes. It is a popular center for tourism, with several embarcaderos offering punts and other boats for hire on the network of canals that surrounds the village. There are also a few shops, cafes and bars in the village. It has a population of about 650 and is heavily dependent on tourism. Pictures here. Still following the trail of "the most beautiful villages" we arrived in Apremont in the Vendée department in the Pays de la Loire region. 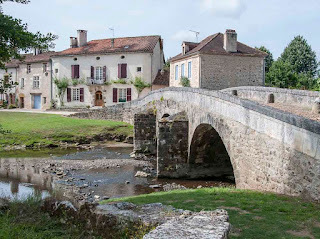 Apremont has existed since Roman times when a camp was built on the left bank of the river Vie. The local terrain is quite rugged lending itself to the development of easily defended areas. Apremont Castle, built in the 16th century on the site of a former fortress by Philippe Chabot de Brion, is one such area. 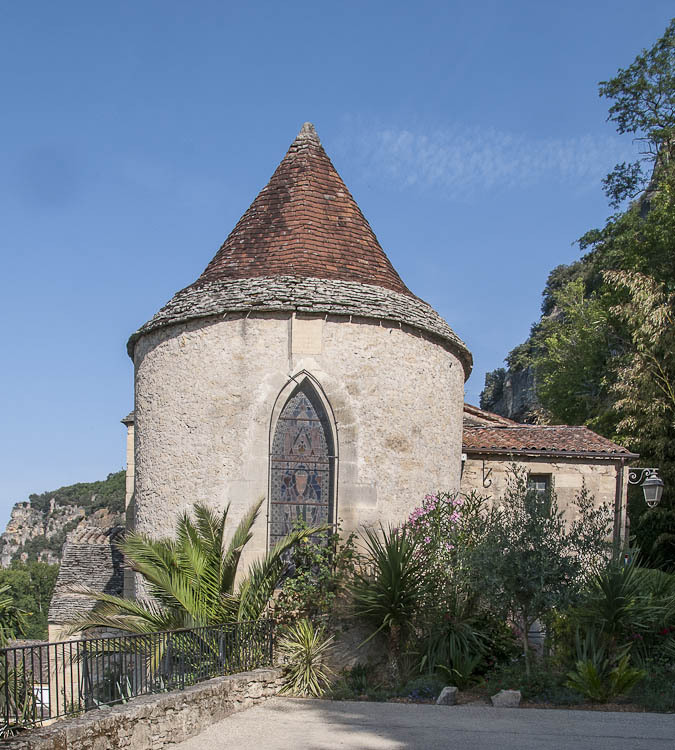 The other significant feature in town is the Church of St. Martins was built originally in the 12th century on a promontory of rock overlooking the river Vie. The current St. Martins was built in 1902 and is endowed with an 83 foot spire and a 16th century stained glass window. The rest of the village looked like, well, a village. No obvious Disneyfication, no super tidy streets just the real thing, a working village using the resources handed down by history. More pictures here. Coulon lies on the banks of the river Sèvre and is in the Deux-Sèvres department of the Poitou-Charentes region in western France. Although the area has been inhabited for a long time, amply witnessed by the discovery of neolithic remains, bronze age items, and Roman relics close by, Coulon itself is only about 1200 years old. The Church of Saint Trinity was originally established in 830 but has been rebuilt several times, the most recent being in the the 17th century after the predecessor burned to the ground. With a current population around 2,400 the village's one time importance as a river transportation link faded with the coming of the railways and today Coulon is a quiet backwater largely dependent on tourists and recreational river related activities. 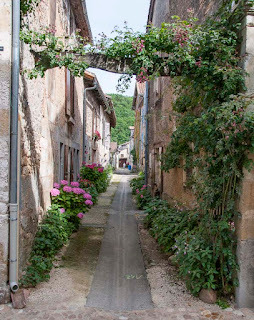 Although billed as one of "the most beautiful villages in France", it is one that has undergone a rigorous and sterilizing makeover by the Ministry of Culture and short of renting a paddle boat on the river there was little left for us to do or see. Pretty much a poster child for how to refurbish a village to oblivion. See here for a few more pictures. Maché was on our itinerary as a convenient overnight stop. 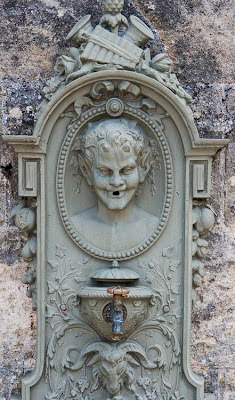 The campsite is called Val de Vie and has 78 pitches (sites) of which 69 have electricity and 16 of these are permanent. The site is open from May 1st through September 30th and an overnight stay costs $30 to $42 depending on the season. The town itself is in the Vendée department of the Pays de la Loire region of western France. The population is around 1,200 and has been growing fairly sharply in recent years - from 740 in 1968, 768 in 1975, 789 in 1982, 899 in 1990 and broke 1000 at 1,093 in 1999. There is some new construction in town with a total of around 606 dwellings in 2007 of which 524 are primary dwellings, 61 secondary residences and 21 vacant dwellings. There is a church and a school. See snaps here. 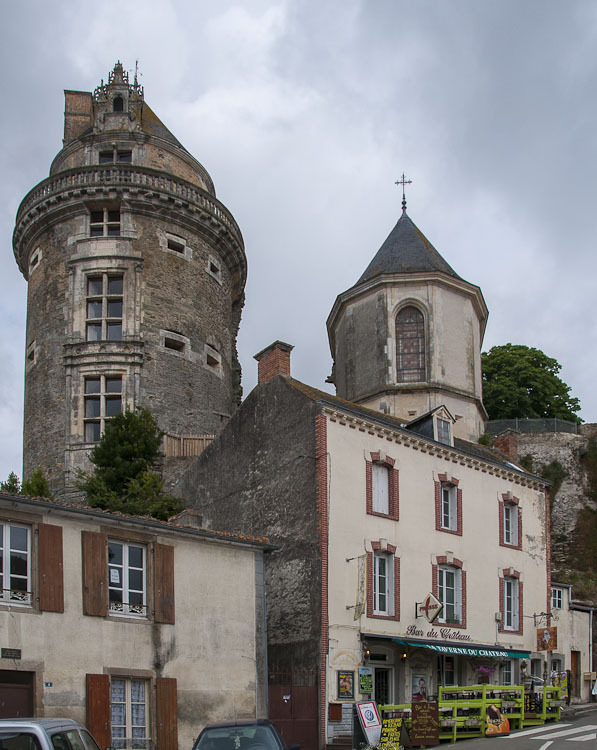 Montsoreau is a tiny market town on the river Loire, close to the confluence of the rivers Loire and Vienne, in the Maine-et-Loire department. With a population between 500 and 600 there is not a lot of industry or indeed much in the way of commerce in the immediate area. At the beginning of 11th century, Montsoreau had already developed as a strategic military point and the rocky outcrop on the left bank bore the castrum of Monte Sorello, an old fortress from the first millemnium CE. The current Chateau was constructed on the bank of the Loire river in 1455 by Jean de Chambes, a senior councilor to King Charles VII. From here the chateau continued to exercise control over river traffic between Chinon and Saumur. Alexandre Dumas' novel La Dame de Monsoreau is based on the amorous escapades of two ladies who occupied the castle during the reign of King Henri III. In 1634 the then lord of the chateau, Rene de Chambes, was condemned for trafficking in salt and other offenses and fled to England. By the end of the 19th century, the castle was abandoned and in near ruin having been used as a warehouse for many years. In 1913, Jean de Geoffre and the Council of Maine-et-Loire acquired the property and it was extensively renovated in 1994. More views of this classy looking mansion here. 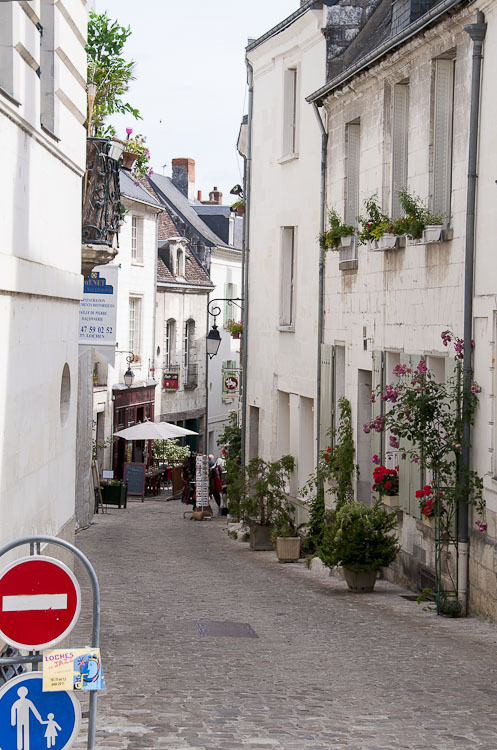 Loches is a small market town in the Indre-et-Loire department of the Centre region. It has actually increased its population by about one third over the last two centuries to its present count of 6,400 persons. The town originally formed around a monastery that was founded about 500 CE by St. Ours and which belonged to the Counts of Anjou from 886 until 1205. 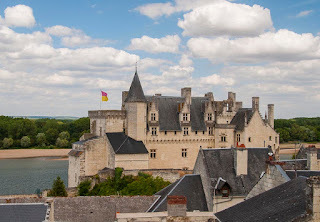 It was subsequently seized from King John of England by Philip Augustus and, from the middle of the 13th century until after the time of Charles IX of France, the castle was a residence of the kings of France. Loches lies close to the river Indre and at the northern foot of a rocky prominent on which was built the Château de Loches. Inside the 13 foot thick wall surrounding the complex is the collegiate church of St. Ours, the royal lodge and the donjon. Designed and occupied by Henry II of England and his son, Richard the Lionheart, the castle stands 100 feet above the Indre. After its capture by the French, it was upgraded into a huge military fortress. The castle became a favorite residence of Charles VII of France and later was converted for use as a State prison by his son, King Louis XI. 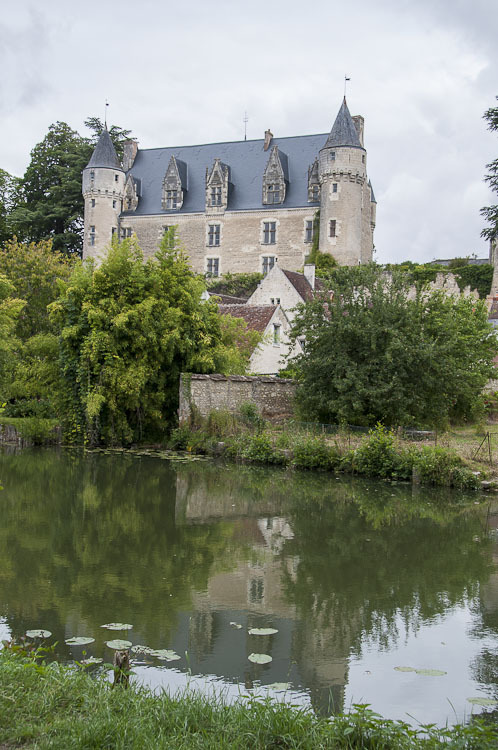 During the American Revolution King Louis XVI used the castle of Loches as a prison for captured Englishmen. During the French Revolution, the château was ransacked and although some restoration was begun in 1806 significant areas exist just as ruins. The 11th-century donjon is a massive 76 feet by 51 feet with walls more than 9 feet thick and its four storeys stand 121 feet high with each floor used as a single room. pottery making along with more modern ventures including electronics and automobile equipment. More pictures here. The village of Montrésor is located in the department of Indre-et-Loire and is listed as one of the 'Most beautiful villages in France'. 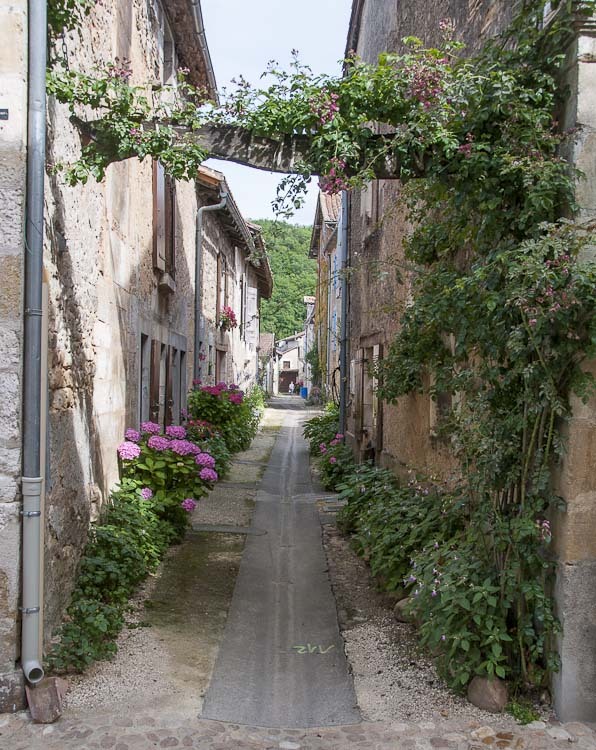 There are more than 150 French villages thus designated and the awards are given in part to encourage the inhabitants to conserve their surroundings. Unfortunately, Montrésor is another rural community whose population is now a little over 300 - down from 600+ two centuries ago. In the lower village by the river Indrois are the remnants of the old water mill and the one remaining lavoir - clothes washing facility. The Chateau de Montresor sits on a granite spur overlooking the lower village while the upper village is home to a grand looking church dedicated to St. John the Baptist. The name Montrésor is attributed by some, to one of the original lords of the village who was the treasurer of Tours cathedral. The "mount of the treasurer" - "mons thesauri" in French - evolved into Montrésor. Likely we will never know for sure. Check out more pictures here. Still in the Indre department of the Centre region, we stopped briefly at Saint-Benoît-du-Sault, a medieval village overlooking the Portefeuille River. In 974 CE, some benedictine monks of Sacierges-Saint-Martin took refuge on a granite spur, where they founded a priory - the future Saint-Benoît-du-Sault. From the 10th to the 17th century, the history of the priory (and the entire village for that matter) is peppered with bouts of resistance against feudal neighbors including the Limoges and de Brosse family. The town was surrounded by a double line of ramparts. The first protected the priory, the church and the fort, while the second, built in the 15th century, encompassed the entire commercial area. Like the majority of small rural communities visited on this trip, populations have roughly halved over the last two hundred years. Saint Benoît is currently hovering around 600 souls. See more of this unique little village. Gargilesse Dampierre, a tiny community of 320 folk or so, lies in a small valley by the Gargilesse river. 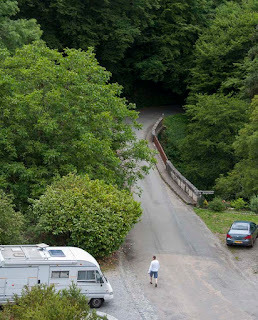 Approaching the village was reminiscent of English driving in country lanes with the hedgerows scrubbing both side of the little camper van for several miles. 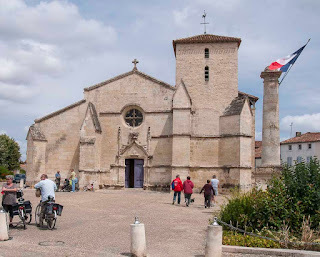 Formerly the site of a Gallo-Roman castle and a Romanesque-Byzantine church of the 12th and 13th centuries, Gargilesse became the retirement village for the French authoress Georges Sand in 1857. It has become a magnet for wannabe artists of every ilk in recent times. Les Comtes de Gargilesse built a fortified castle here in the 13th century. Hugues de Naillac, Lord of Gargilesse led a crusade to the Holy Land and brought back a statue of a byzantine Virgin for which he built the Romanesque chapel next to the castle. In 1750, following a fire and subsequent deliberate dismantlement, the castle was rebuilt as a manor house. 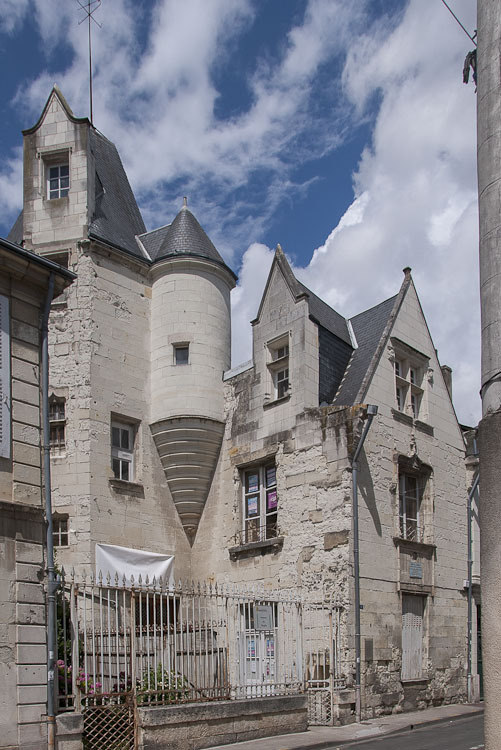 In 1998, the painter Annick Thevenin purchased the castle to create an Art gallery. At the age of fifty three and at the height of her career, George Sand dreamed of retirement and a place to settle, finally choosing Gargilesse. This indeed proved to be a paradise for George for, between 1857 and 1862, she wrote thirteen novels, two volumes of essays and three plays. Her work "Elle et Lui", at 620 pages was written in just 25 days! Sand's house was purchased by the commune in 1959. More pictures here. Châtillon-sur-Indre is a small town of less than 3000 population in the Indre department of central France, in the Centre-Val-de-Loire region. The town has a citadel looming high against the skyline and a Roman church of some interest. 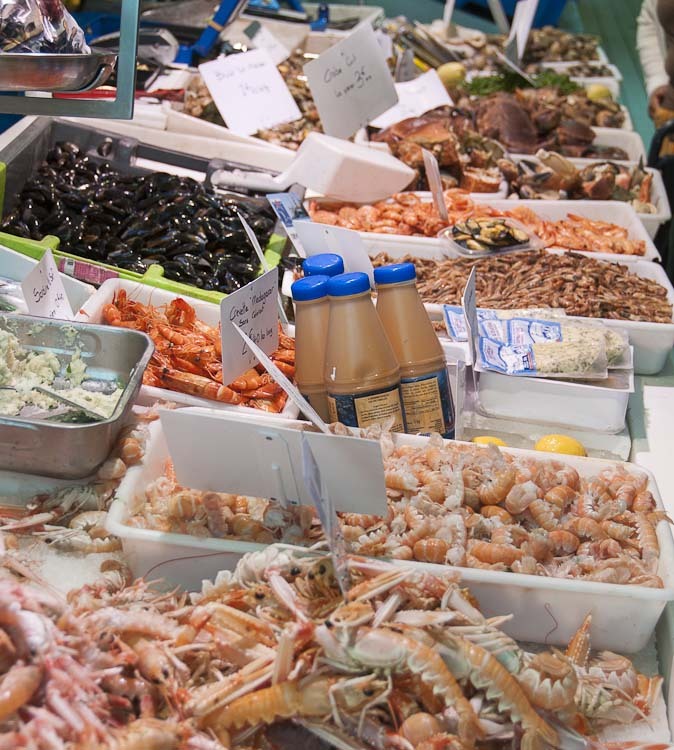 There is adequate shopping available in and close by, with large supermarkets for everyday essentials in addition to smaller and more intriguing shops peppered around the old town. Every Friday morning the market is in town for farm fresh produce and tasty treats. With its superb location in central France, Châtillon-sur-Indre lies on the edge of the Brenne National Park providing miles of nature trails for walkers, cyclists and horse-riders. See here for more pictures. From its beginnings in 1930s California, when acned young bloods began racing each other light to light, Hot Rodding has matured into an international hobby. The Model T Ford was in vogue when the fad began and since then all manner of roadsters have been lovingly transformed to the will of the owner. Hot Rods were formally organized in the US in 1940 followed by Australia in the 1960s then Britain and Sweden in the 1980s. 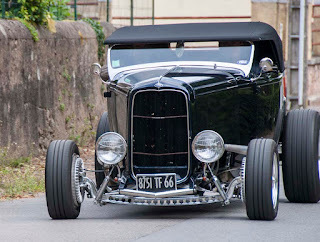 In 1991 La France Street Rod Association (FSRA) was established bringing together fans of Hot Rodding in France and promoting it to the public. Since 1992 FSRA has organized national and regional events and it just so happened that a group drove through Herisson while we were there. If you like to see these alter-ego automobiles check them out here.